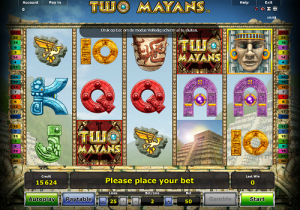 Two Mayans, brought to you by Novomatic, is a modern slot game based on an ancient civilisation! The Mayans were an incredibly sophisticated people whose empire stretched over Central America and began over three and a half thousand years ago. The Mayans were known for their architecture, art, maths and their calendar and now, in this amazing Novomatic slot game, they’re known for their wins! This 5-reel, 25-payline slot game is visually breath-taking and monetarily generous! It’s the sort of game that will suit both beginners and more well-seasoned players as it’s simple yet not boring at all. Players who enjoy other Novomatic slot games, such as: Book of Ra Deluxe, Pharaoh’s Tomb and Red Lady will definitely get a kick out of spinning the reels on Two Mayans. What are you waiting for? Journey into Central America and start getting those big wins with Two Mayans from Novomatic – the best online slots developer ever! Every single symbol in this Mayan-themed slot game has been carefully and wonderfully designed to fit this amazingly ancient theme. Even the lower-paying symbols, which are the card value symbols, look as though they have been intricately carved out of stone by the Mayans themselves and this only adds to this slot’s vibe as many other slot games just don’t even bother to personalise these card value symbols at all. The card values in Two Mayans include the 10, Jack, Queen, King and Ace. The higher-value symbols in this slot game include all sorts of ancient artefacts and from lowest-value to highest-value there is: a golden bird stone carving; a golden head stone carving; an ancient pot; an ancient sculpture of a Mayan; a golden Mayan medallion; a Mayan temple and the Two Mayans symbol. Whenever you spin three or more matching symbols, on consecutive reels from left to right, on one of the active paylines, you’ll get a payout. Payouts will increase or decrease according to your bet, which you can adjust by choosing the number of lines you wish to have active and then choosing how much to bet on each of those lines. The paytable shows payout amounts according to current bet, as well as more rules and other information about the game, including RTP percentages. A Novomatic slot game wouldn’t be complete without a little bit of magic and in this slot game the magic is distinctly Mayan! The Mayan Wild symbol is extra magical as this can substitute for any other symbol, except the Bonus symbol, which means that when it falls on the reels it gives you better chances at getting wins! The Bonus symbol is magical too, as this can give you the gift of free spins! Whenever you spin three or more Bonus symbols on these Mayan reels, you’ll be given a generous number of free spins and during the free spins, the Bonus symbol also acts as a Wild symbol and substitutes for other symbols so your chances of getting wins will most definitely be magically increased. Two Mayans also has classic Novomatic features, such as autoplay and gamble. Here at NovomaticCasino.co.uk, we might not have a lot of Mayan-themed games but we do have a lot of Novomatic magic! Novomatic are renowned for being one of the earliest and best developers in the business and on top of their amazing range of slot games, they also have a wide collection of table games and live casino games, including Blackjack, Baccarat and Roulette. These games by Novomatic are high-quality, authentic and offer fantastic and competitive RTP (return to player) percentages.